If you’ve seen the movie, “Spirit,” you know that cowboys and settlers captured wild horses and tamed them. But wild horses, or mustangs, still roam parts of America today. When Spanish explorers came to America in the 1500s, they brought horses with them. Some of those horses escaped into the wild. Today’s wild horses are the descendants of these early horses. Wild horses live in western states like Colorado and Idaho. Some live on islands off the east coast. Wild horses live in western states like Colorado and Idaho. More all about wild horses is that some live on islands off the east coast. There are wild horses in other parts of the world too. 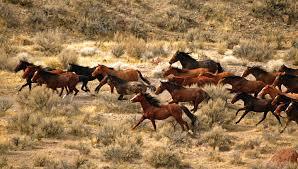 Pockets of wild horses remain in Europe, Asia and Australia. Wild horses live in herds. A male horse leads a herd of females and foals. 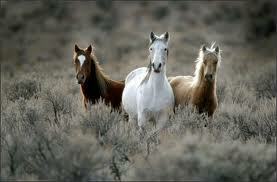 Australian wild horses are called brumbies. Wild horses live on land owned by the government in the U.S.
European wild horses, the Dulman horses, live in woodlands and forests in Germany. Wild horses live in herds. A male horse leads a herd of females and foals. When young male horses are two years old, they leave the herd and live with other young males. Wild horses graze on grass and leaves. A nature film about the lifestyle of wild horses. Question: Are wild horses dangerous? Answer: Wild horses are wild animals and will kick and bite if frightened. Question: Are wild horses protected? Answer: There are laws in the U.S. protecting wild horses, but the amount of land available to them is getting smaller. Enjoyed the Easy Science for Kids Website all about Wild Horses info? Take the FREE & fun Wild Horses quiz and download FREE Wild Horses worksheet for kids. For lengthy info click here. Declan, Tobin. " Wild Horses Fun Facts for Kids ." Easy Science for Kids, Apr 2019. Web. 21 Apr 2019. 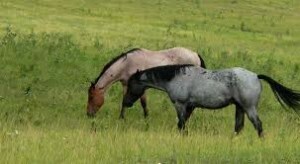 < https://easyscienceforkids.com/all-about-wild-horses/ >.